I’ve always made a point of scheduling a coffee ‘meeting’ at least twice a week. One is with someone new that I’ve just met and the other is usually a colleague that I haven’t seen for a while. I’ve made it part of my weekly routine and business plan. Last week I was working with my mentoring client and discussing how coffee can be good for business. She was not convinced that having coffee meetings with her colleagues was a good idea. "It takes too much time out of my day…it’s faster just to call them on the phone…emails are more efficient,” she said. Efficient for who? Business is built on connections and relationships not texts, emails or phone calls. Inviting someone to coffee can create new opportunities and the benefits can outweigh the ‘extra time’ it will take out of your day. There are many very successful business people that work out of their home. They don’t have that office or receptionist. They have kids, and toys and pets and in-laws.Think of the coffee shop as neutral ground – everyone has the same type of chair to sit on, the same menu of coffees to choose from and there’s no pressure to impress or be impressed. Meeting in a coffee house can create a more relaxed environment and allow your guest to relax and be a little bit more open in their conversation with you. 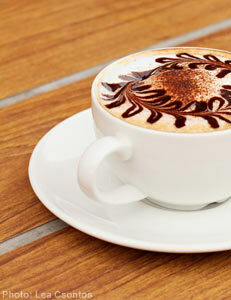 Having coffee adds a ‘social’ component to your meeting. You get a chance for a bit of small talk while you’re waiting in line or getting settled at the table. It’s all about relationship building, not selling. With someone new, you’ll want to get to know them and get a better understanding of who they are. This is your opportunity to find commonalities between you. With someone you know, get updated. Connect! In comparison with attending a networking event, a coffee meeting can be much more effective when you are focused on the person you are with and not distracted by having only 20 seconds to introduce yourself, thinking of what you are going to say instead of listening to the other person or wondering if you should have that last sausage roll from the buffet. Coffee, whether it’s decaf, instant or ‘fully leaded’ – it is good for business. Now go get Connected!